Come on out to Galt Airport on October 13 and join the crazy fun during the annual Planes & Puppies event! Bring your own dog or meet some adorable shelter dogs that will be there, hoping to find a new home. 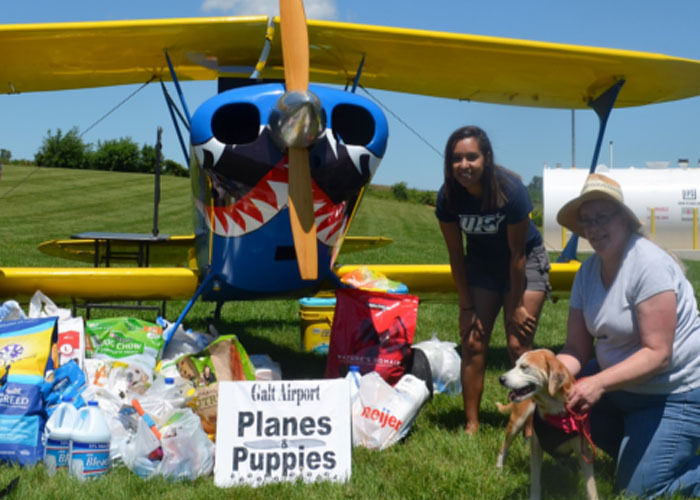 Please bring a donation and help us to stuff our biplane with supplies for the Animal House Shelter. In addition, EAA Chapter 932 will be hosting a Young Eagles Rally, providing FREE airplane rides to kids age 8 to 17. The nationwide Young Eagles program introduces children to the world of aviation. To date, the program has flown over 2 million kids with the help of EAA’s network of volunteer pilots and ground volunteers. Please click on the Young Eagles tab at the top of this page for more information.